What a way to start summer… I should have never stood up to that bully Jacob. It was just a water balloon thrown to save my friend’s behind during recess. Now we’re on a bus heading home and everyone gets the same text: “$500 gift card and full immunity to the kid that brings me Aiden- Jacob.” I’m Aiden by the way, and the entire fourth grade is staring at me. Hopefully, with my friend’s help, we can get off at the next stop, three miles from my house, and make it home before the entire neighborhood finds us. Soaked is the first middle-grade novel by author/illustrator A.J. Cosmo. Filled with humor and suspense, this surprising page turner is a tale of friendship, courage, and standing up for what’s right. For 3rd-5th grade readers. It’s odd to address relaxation on a blog post that’s meant to promote my novel Soaked, but lend me your ear and things will make sense. Being an independent author is hard work. I know many of us go online and tout about the "revolution", the fantastic revenue, the thrill of doing it all yourself. However, the gross reality is that it’s essentially like having six to fifteen jobs all at once. Either you are managing your own time, creating all of the moving pieces of the book by yourself, or you are managing others; hiring, approving, correcting, and even firing. All of this takes enormous amounts of time. I’m not alone in this. A recent Gallup poll of American workers noted that the average work week has gone up to 47.6 hours. That’s almost a full extra day of work! I myself work every day, even so called rest days, just so I can keep up with the pace of the world. And no matter what I do, there is always more to be done. One huge drain on our time is the convenience of communication. We are tethered to a system that constantly demands attention on its own, but also interfaces with people who have the right to demand time as well. Your boss can send you a message at three in the morning just as much as your teenage daughter can. Everything wants time, and the awful thing is that a lot of these systems were designed that way. So, what does this all have to do with Soaked? Well, beyond the fight it took just to complete the piece, Soaked is about going against the grain of the status quo. The main character, Aiden, is the only kid in school with the courage to stand up to the dominant bully, Jacob. Busyness is the bully in all of our lives. We are constantly drained and fighting for the next morsel of money. As we work harder, we worry more, and we grow increasingly exhausted. The harder you work, the less energy there is to work more. Yet we still continue to drain ourselves because, culturally speaking, rest has become an activity only for the lazy. What I'm calling for right now is for everyone reading this article to stand up to the bully and demand time for yourself. Schedule rest just like you would chores, or a meeting, or an important project. We are not effective workers if we do not give ourselves time to recharge, same as we cannot be there for our loved ones if we have no alone time. This American work ethic is unsustainable both emotionally and economically. You cannot till fields until they are barren, just the same as you can't extract increasing amounts of time from your employees until they are no longer capable of performing. Stand up to the bully. Be the hero of your story. And if you know of a boy in the third or fourth grade who would appreciate a good action book, check out my first novel Soaked, available in both paperback and Kindle formats. 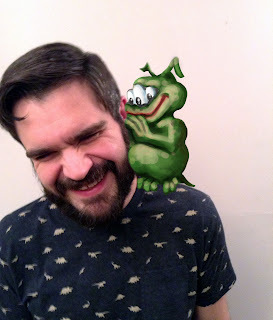 The Monster That Ate My Socks.” He is also a consultant and publisher to other independent writers and illustrators. That was the first thing that crossed my mind when the water balloon splattered on Jacob's face. Jacob, the boy who never needed a hall pass. Jacob, the kid who never ate his own lunch. Jacob, the one you cleared the bathroom for. Cowards don't do this, I thought. Cowards run. Let everyone who has ears to hear know that I, Aiden Jones, am a coward. Jacob let go of Ben's collar and let his victim join my side. Our classmates fell into a sick silence. No one knew what to do because no one had ever challenged Jacob before. What about me though? What did Jacob have in store for me? Would he drag me into the bathroom and give me a swirly? Would he hold me under the water fountain? Would he stuff my pockets with water balloons and make me do jumping jacks? The summer sun pulled the water from his shirt, just as it soaked up the moisture from the plants and our skin. Since the drought began in the mid-west, our cozy little school had turned into a solar oven. The worst part was that the principal could have cranked up the air conditioning and given us all relief, but she didn't, not even on the last day of school. That's just the kind of lady she was. "Jacob--I didn't mean to--I mean," I said. "You almost got my phone wet," he growled. A.J. Cosmo is the author and illustrator of over forty children’s books including the best-selling “The Monster That Ate My Socks”. He lives and works in Los Angeles, loves reading and video games, and is hard at work finishing the Monsters A to Z series. 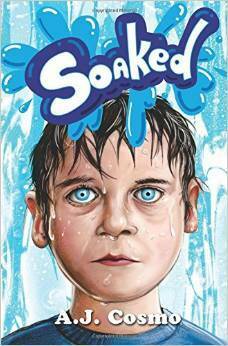 “Soaked” is A.J.’s first middle-grade novel. A. J. Cosmo will be awarding a $75 Amazon or Barnes and Noble GC to a randomly drawn winner via rafflecopter during the tour. Thank you Shannon! Glad you like it. I really enjoyed learning about you and your book! Great picture! Thank you for sharing! I really love the premise of this book and have been sharing it in my reading groups and on goodreads.. thanks for sharing! "I'm a coward. That was the first thing that crossed my mind when the water balloon splattered on Jacob's face." Great opening! Such a fun author picture. Enjoying following this tour, thank you! A bully *and* a rich kid. I can't imagine having $500 to spend on that kind of gift card reward now as an adult, much less when I was a kid! Wow... I'm laughing now, picturing Andrew McCarthy in his "Pretty In Pink" 80s best, shrunken down to middle-school size, blazer and all! Liked the excerpt, loved the author photograph. Hi, the book sounds great! Too bad I don't have any children to show it to, but I'm going to share on Facebook. Thank you for the generous giveaway, my fingers are crossed! This looks like a great kids book! I'll have to pick up a copy for my niece and grandniece!